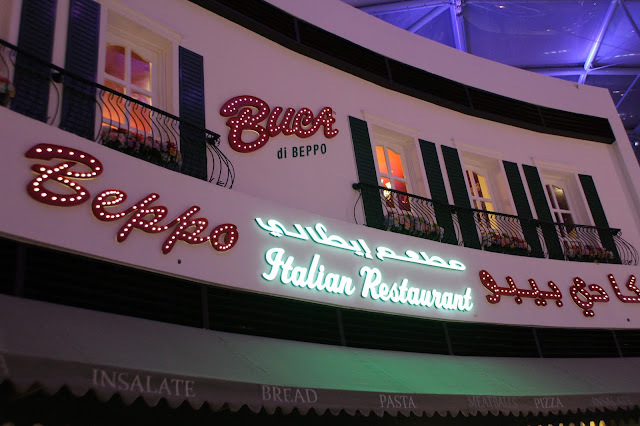 One can spot Bupa di Beppo, the American chain of Italian restaurants, from quite a distance a sone enters the Cascade dining part of Yas mall. There is a quirky village feel to the lighting as one approaches. 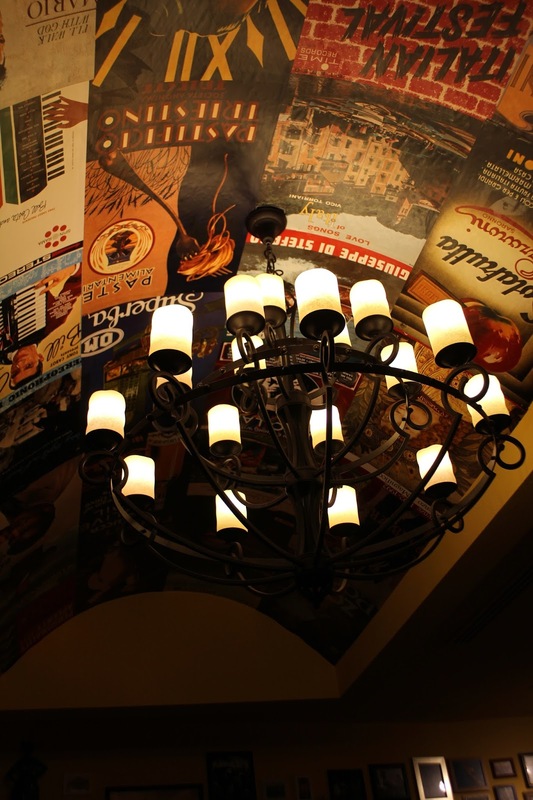 At a time when restaurants are trying to lure customers to its table, it certainly is eye catching. 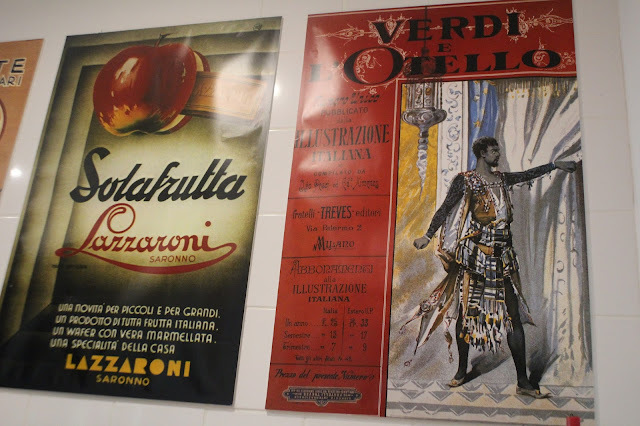 This continues once inside, with pop art posters and images of people getting stuck into their Italian dishes on the walls. 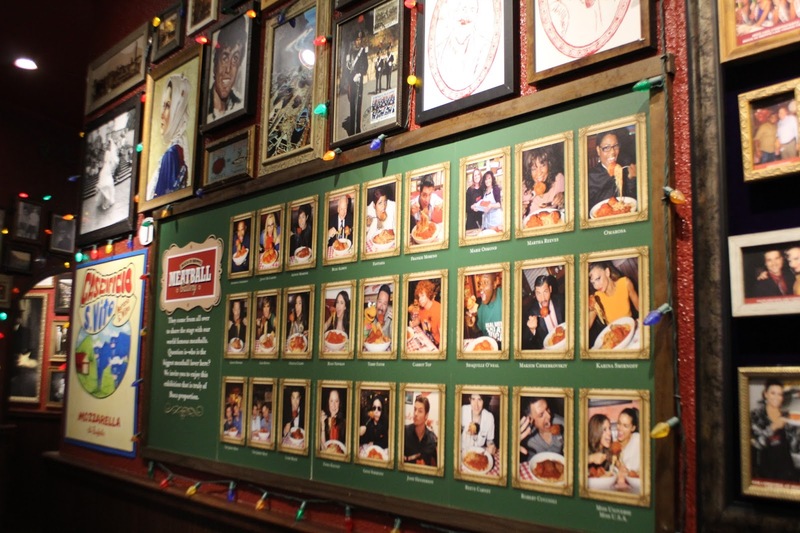 Buca di Beppo, with its family style and sharing approach to dining has a lively atmosphere, with twenty something year old waiters and waitresses generally ensuring guests' orders are taken quickly and food served accordingly. 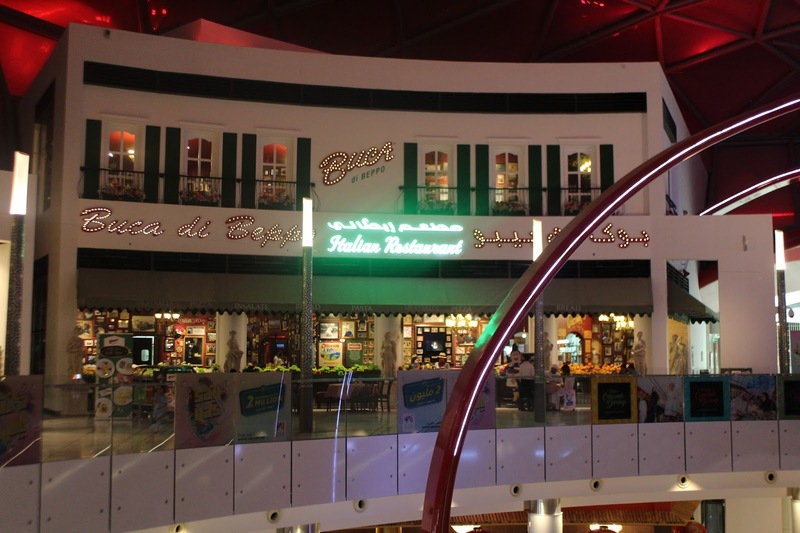 It is not small, with the restaurant able to accommodate around 300 diners, if you include the terrace seating area. My guest and I are here on a Thursday night and there is a real family feel to the place with children typing away on their ipads. As a father of an 11 year old, I could see her enjoying this atmosphere. I usually avoid mall eateries because they tend to get busy and noisy, but an 11 year old would choose this 9/10 times over the more mature atmosphere typical hotel Italian restaurants. My guest and I start off with a few appetisers. 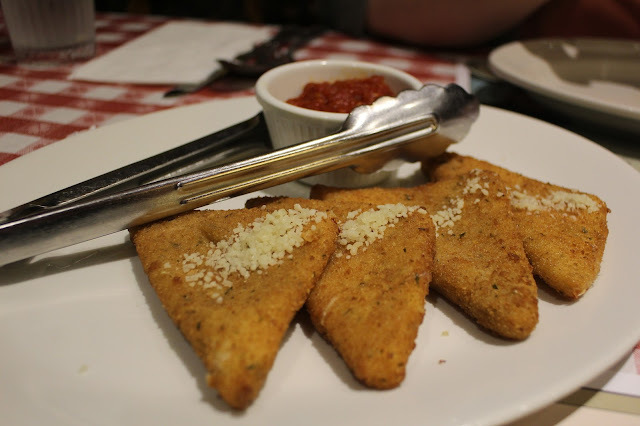 We have the Mozarella sticks or triangles. They are big and more than good enough for two people. 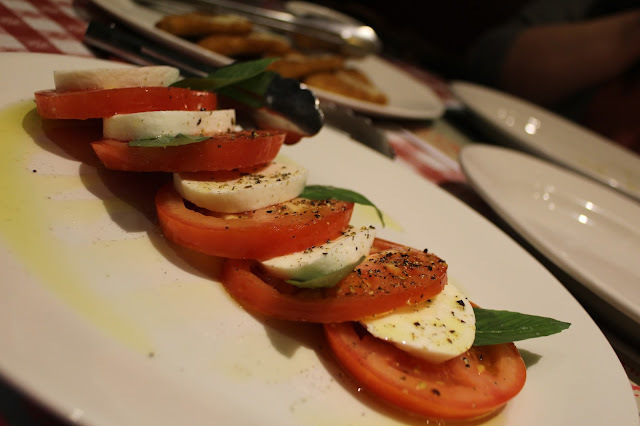 We also have the Caprese salad, which would have benefitted from tomatoes a bit riper. Lovers of basil will appreciate the basil infused olive oil! Again though, relative to the price, this is a value for money way to start the evening. 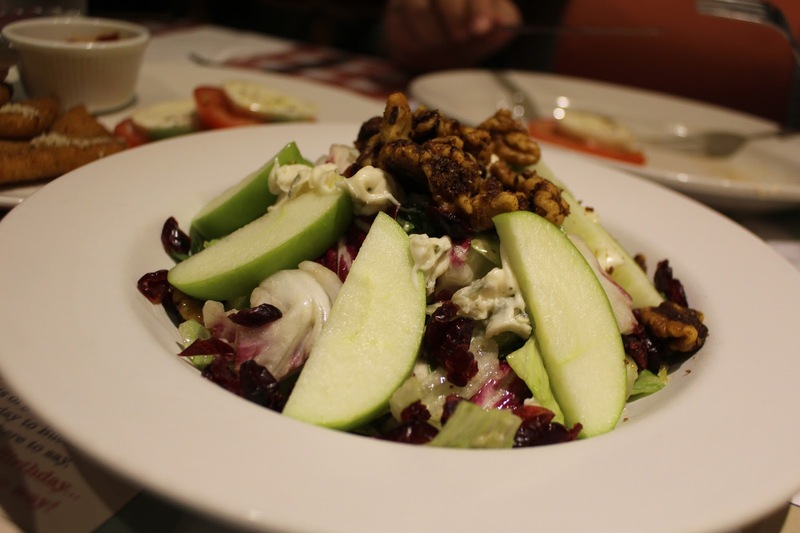 curious about the Apple gorgonzola salad - the promise of these contrasting flavours enough to lure me to it. It does not disappoint. An innovative approach to the dishes is the variety of sizes, emphasising the sharing ethos of the restaurant. The large salad comes in at 155 AED, but is actually a huge saving opportunity if all 6-8 guests, for example are happy to share this salad. 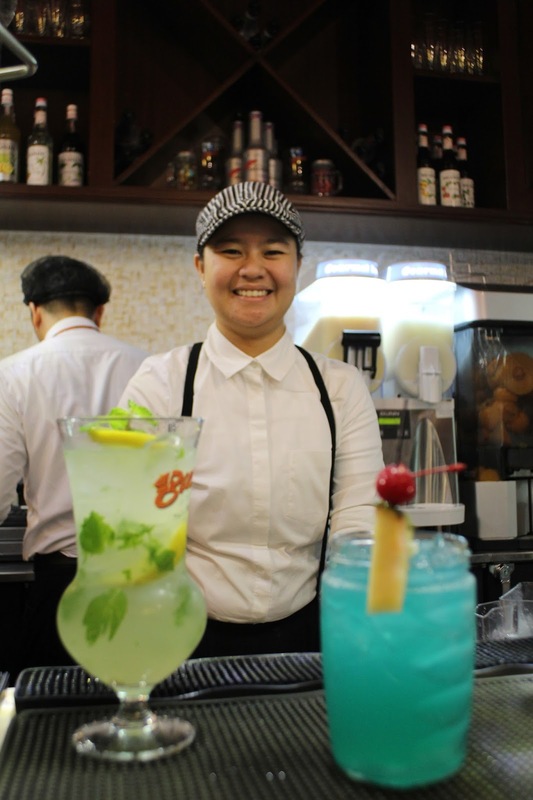 What do you do when you do not serve alcohol but want to offers diners a fun drinking experience? 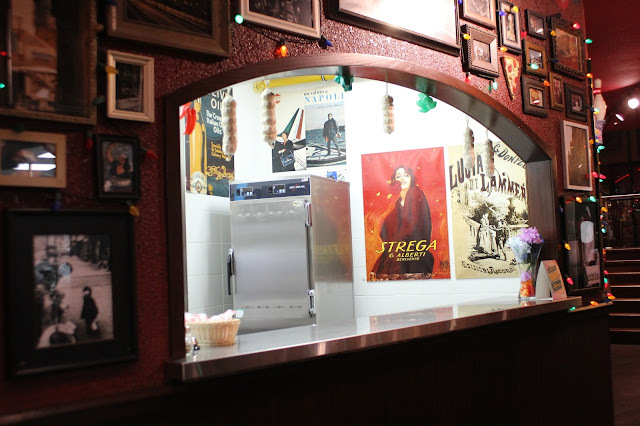 Create an open bar area where you can watch mocktails and signature Buca drinks being made. They seem to have the right staff behind the 'bar' - you want people who are fun, energetic and happy to engage with curious guests. The menu is varied. You may need time to see what you want. What I do know immediately is that I want to have my main course in the kitchen area - there is a table specially created for a small group of about 4-6 people who can eat there and watch the operations going on. Cool! The kitchen dining experience is something I would recommend for couples and friends. it gives you a perspective of a restaurant you would not otherwise have and it allows you to see so many other dishes on the menu as they are prepared and sent out to tables. 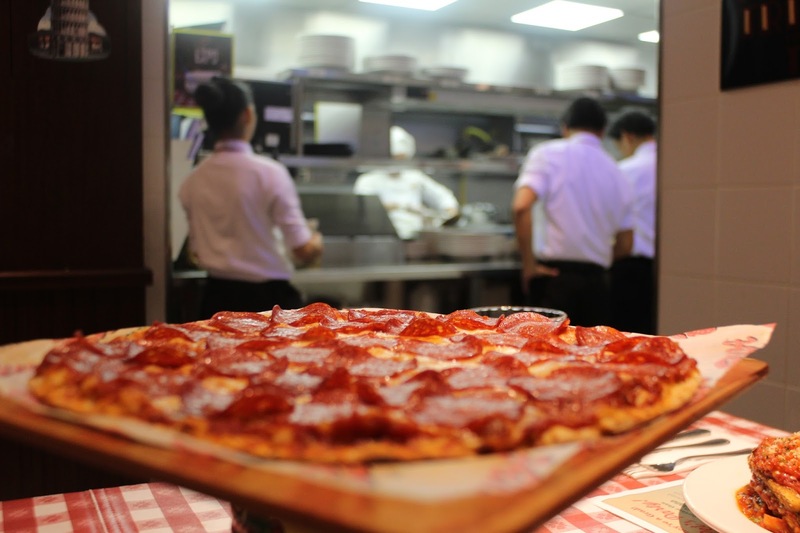 This gives Buca di Beppo something over rival family restaurants - it is the value added experience that people are looking for nowadays. 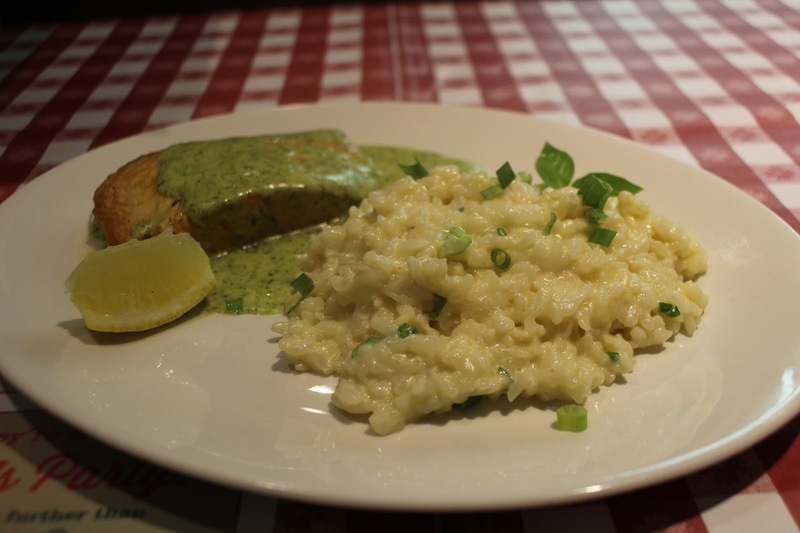 On our visit the restaurant ran a Risotto promotion - again, big hearty portions underline the value for money aspect of the restaurant. When you are taking your family for a night out in a mall, this is very important. 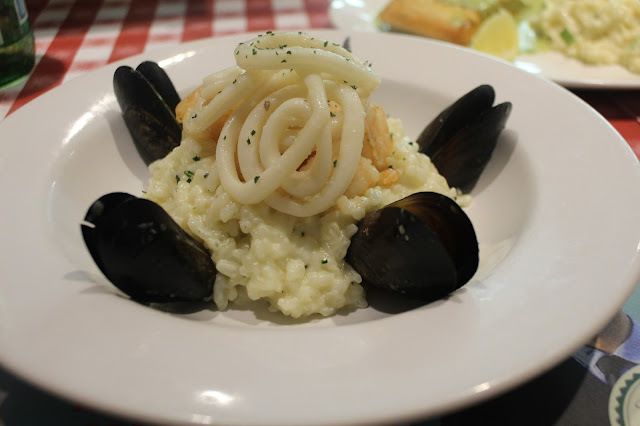 If on your visit they still have the Seafood risotto, I do recommend it. 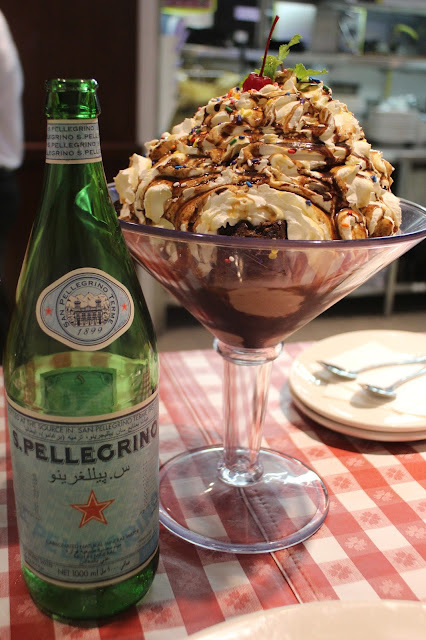 For dessert, you must have the utterly decadent and over the top Colossal Brownie Sundae which includes 12 chunks of brownies and 6 scoops of vanilla ice cream. This dessert has that 'conversation piece' quality about it, something you will tell your friends about. I reckon it is good for 4 people, or after a bad week, you might indulge yourself? Buca Di Beppo is a fun filled night out with some nice dishes served in big portions. At a time when we are all feeling the pinch in Abu Dhabi, this restaurant has that added value that we are all looking for. 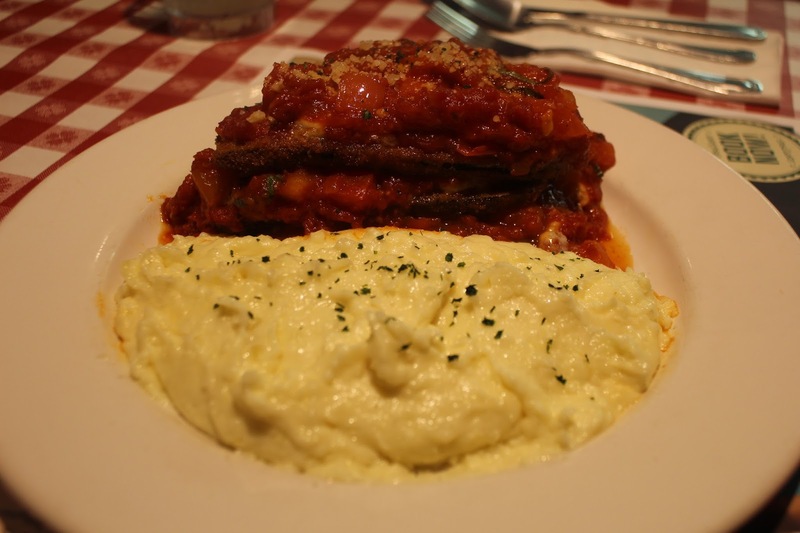 It has a genuine sharing menu with different sizes of many dishes. Add to this the extra things like dining in the kitchen, checking out your drinks mixed you have a decent night out for the family.